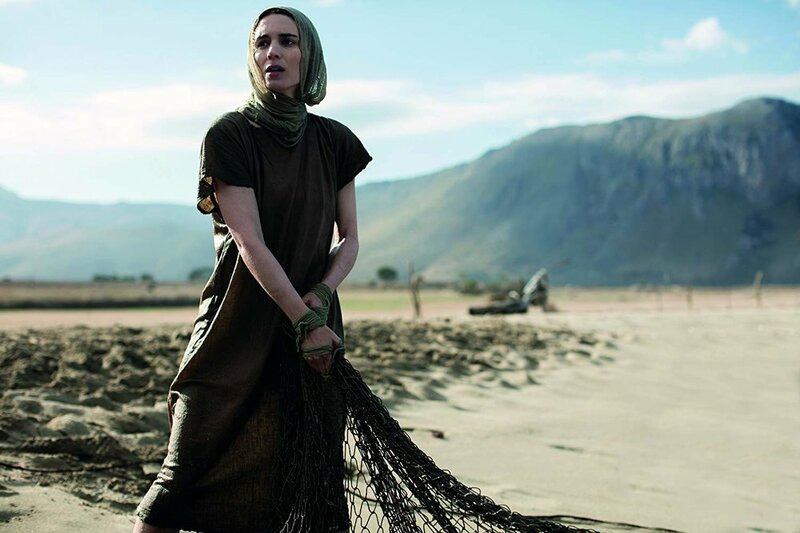 Led by Rooney Mara and Joaquin Phoenix, Mary Magdalene delivers on the promise of being well-performed and expertly acted. The film’s cinematography is its finest quality; a movie one can easily get lost in, when looking at the visuals. Those interested in the story, and how Mary Magdalene is depicted, will be finally able to see a film that has been trying to get released since 2017. The movie’s glacial pace and almost inert action makes it a challenge to get through at times. This is not a film typically championed by the faith-based film community. Rated R for bloody and violent images, Mary Magdalene is more at home in an arthouse setting, as opposed to a giant multiplex with reclining seats and massive buckets of popcorn and soda. Earnest, but lacking in strength from a script standpoint, Mary Magdalene feels as if a few talented actors are walking a repertory theater through their paces. The movie never finds a spark. The story of Mary Magdalene, and how biblical teachings have viewed her over time, has shifted. Once deemed a prostitute, or promiscuous woman, or a carnal partner to Jesus, those sentiments have long been dismissed. Her place in canonical history, as a woman who witnessed the crucifixion, burial, and resurrection of Jesus, should give rise to a fascinating story; as Vox reviewer Alyssa Wilkinson astutely points out: A rare religious-themed film about a female character. What we get with Mary Magdalene, directed by Garth Davis (Lion), is a slow churning, densely spoken drama which fails to move the needle emotionally in any meaningful way. Earnest in its attempt, with two workmanlike performances from Rooney Mara, as Mary, and Joaquin Phoenix, portraying Jesus, Davis’ film is glacially paced with a lead weight of a screenplay by Helen Edmundson and Philippa Goslett. The film plays like something of an origin story, with Mary becoming a follower of Jesus of Nazareth in Judea, c. 33 AD. Prior to Jesus’ crucifixion, the film focuses on her becoming a disciple and an eventual confidante to the father of Christianity. Mara plays Mary observant, wise, and tactile - a woman unafraid of anything she may encounter. That bravery and confidence adds to the tender tone that Mary Magdalene is aiming for. Unfortunately, we simply never get enough activity within the story to propel us forward emotionally. As Mara and Phoenix’s characters become more bonded together, and Mary a valued and trusted apostle in Jesus’ inner circle, we see emotional connections being made, but always from a distance. Davis, unlike with his debut film Lion, never allows viewers into that proverbial inner circle. We observe Jesus sharing His teachings and spreading word of the gospel, while Mary’s allegiance becomes a source of frustration with Saint Peter (Chiwetel Ejiofor) and Judas (Tahar Rahim). However, Peter scowls a lot and Judas, as we know, has other motivations which become apparent as the movie goes along. The film may suffer in story execution but has tremendous below-the-line work from cinematographer Greig Fraser (Zero Dark Thirty, Rogue One: A Star Wars Story), and costumer designer Jacqueline Durran (The Darkest Hour, Anna Karenina). Fraser especially captures some beautiful imagery from the Southern Italy towns and villages which were used as shooting locations for the film, while Durran strikes an air of authenticity in the robes, gowns, and garments she provides for the cast. Mary Magdalene looks the part. There is simply no spark. Mara and Phoenix create a unique on-screen chemistry (they became a real-life couple during the shooting of the film), but their necessary chaste connection reaps little benefit to the emotions swirling around Mary’s story. As good as both of them are are, Mara especially, elements of the film feel like Phoenix, Mara, Ejiofor, and Rahim were brought in to lead a repertory cast through a local production of the Mary Magdalene story. The script expects a lot of its viewers, and the droll, dense approach to conveying themes of female empowerment, loyalty, faith, and how faith can change a person, seem lost repeatedly within such ponderous wordplay. Frustrating is a word that comes to mind. Mary Magdalene was lost in the shuffle of the liquidation of The Weinstein Company’s implosion in 2017, and has been waiting for a North American release for nearly 18 months. Acquired by IFC Films for domestic distribution, the film previously played festivals in 2017, overseas in 2018, and its release here in 2019 is something of an afterthought. All of this is a shame because Mary Magdalene deserves a terrific story, her appearance in canonical history one of the more curious and often debated, for centuries among theologians and biblical scholars. Unfortunately, as it turns out with Mary Magdalene, we are still waiting for that movie to arrive. Starring: Rooney Mara, Joaquin Phoenix, Chiwetel Ejiofor, Tahar Rahim, Ariane Labed, Denis Ménochet, Tchéky Karyo, Ryan Corr.